It seems like no matter where we turn our attention, the terms “big data” and “analytics” are everywhere, hitting the headlines and popping up in conversation. But, they’re not just buzzwords anymore. People from all sorts of industries are praising the benefits of using these prized bundles of information to make decisions for their businesses, and for good reason: it’s working. In a recent survey by Regalix, 71% of the B2B marketers polled said that drawing on marketing analytics has helped them increase their sales by 11%–50% and even more. However, doing that isn’t limited to marketers and big corporations. Hoteliers like you are jumping on the data bandwagon, too. 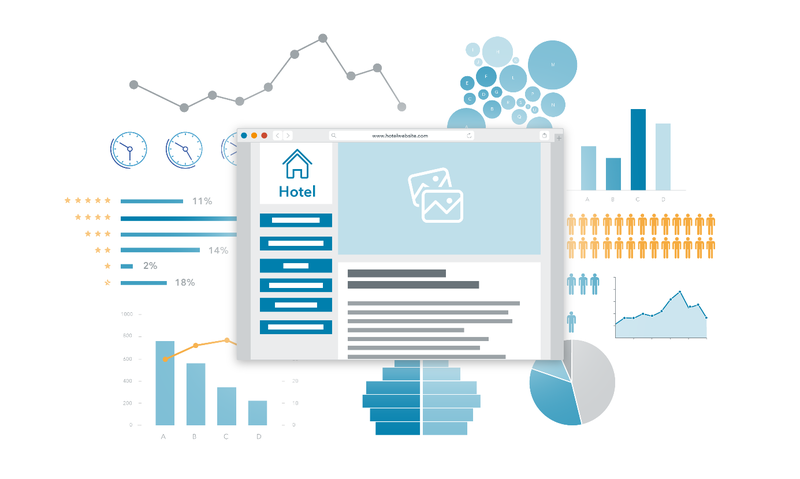 According to Hospitality Technology, nearly one third of the hoteliers surveyed said that they’ve set the strategic goal to improve business by using customer analytics. Ranging from how and when they book to their purchasing power, these analytics offer deeper insights into traveller behaviour. Although it’s great to be spoilt for choice from the sheer amount of accessible data on travellers, it’s best to focus on the actionable data you can apply towards promoting your offers to the travellers likely to react. Not only that, you’ll want to go to a single source to get the data you need. Every action, every click, every hotel view on trivago by a traveller is a piece of data. When we crunched that raw data from the 2 billion visits we receive annually from travellers searching for their ideal hotel at the lowest rate, we were able to identify three types of data that play the biggest role in your property’s online performance. These give you a better perspective on where to focus your efforts most, and the analytics provide you with the insights into how you should present yourself online as the ideal hotel to your ideal guests. Many factors influence the demand for accommodations, but the two most relevant are seasonality and events. By keeping a close eye on how hotel searches in your location evolve over time, as well as reviewing how they developed in the past, you’ll be able to best adapt your rates and promotions accordingly. That way, you’re always in a position to make the most revenue possible, whether demand is rising or falling. If you have Hotel Manager PRO: Look at the search volume functionality on your rate shopper to assess the exact level of hotel searches in your area throughout the year. Be sure to also monitor the events calendar to see if an upcoming event may increase demand for accommodation. Their nationality: Determine where travellers are coming from, so that you know what languages and online platforms to introduce yourself to them. The purpose of their stay: Promote your special services and amenities based on travellers’ needs. Weekend travellers may be interested in a late checkout, while not including free breakfast could be the deal breaker for the business traveller. If you have trivago Hotel Manager PRO: Review the analysis on travellers, available on the Visitors’ Profile page, to get an overview of the ones looking at your profile, as well as their average number of overnight stays. You’ll also want to have your hotel description professionally translated to appeal to those travellers in the top 10 countries from which your hotel profile receives the most clicks. When you learn what your direct competitors are offering and how they’re promoting themselves online, you can figure out how to set yourself apart. To better compare yourself with your competitors, it’s best to go to the same source that has information on them and your property. First, take a look at your competitors’ pricing strategies. Which booking sites are they working with and how much are they advertising their room rates there? By doing so, you’ll be able to benchmark your prices against theirs and adapt yours accordingly. Second, check the analytics on their potential guests. If a certain segment of those is your target audience too, see what your competitors are doing to attract them. This gives you the chance to stand out to travellers by making your offers and hotel profile unique. If you have trivago Hotel Manager PRO: Compare your pricing structure to that of your five main competitors on your rate shopper and monitor how they adjust their room rates over time. You can do so up to six months in advance by clicking through the calendar on your dashboard. The tools of your rate shopper help you spot occasions when you can decrease or increase your prices to secure a competitive advantage.